Are you looking to refer? 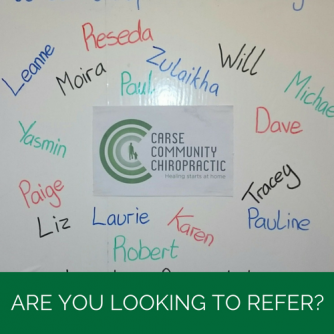 Carse Community Chiropractic's belief is that chiropractic care, like other health measures, is there to be utilised regardless of an individual's level of health. We all know we can improve ourselves on a daily basis. A perfectly healthy person needs a good diet, regular exercise, proper rest, a good mental attitude and a nervous system without interference. A person at the other end of the spectrum needs the same. Here at Carse Community Chiropractic we are aware that some people would first like to know how chiropractic care could help you wherever you are on this health spectrum before starting care. If you are one of these people then here at Carse Community Chiropractic we offer two complementary ways to test how chiropractic could help you to invest in your health. The first is through our introductory class and the second is through our complementary 15 minute Chiropractic Screening. 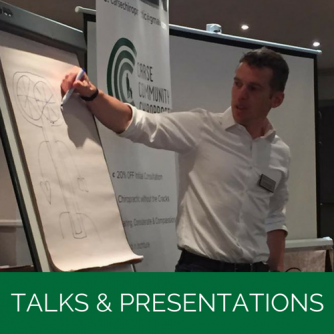 The main thing with our screenings is to give you an opportunity to find out a bit about Chiropractic, how it could help you or someone else you know, and for me to assess if Chiropractic is right for you. 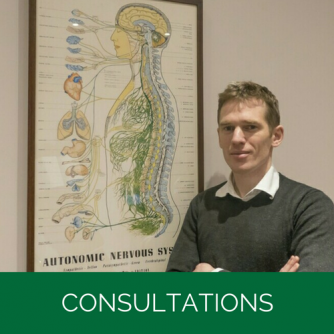 It will involve you coming to our practice and letting me know if you have any problems, how you would like chiropractic to help you and how any problems affect you and then I will undertake a brief assessment to see if I think Chiropractic could help you. It will not involve any care on the day or the need to remove any clothing other than coats, jumpers, jackets and shoes. The next stage would then be to book in for a consultation. Therefore, I would encourage anyone with queries regarding chiropractic, for yourself or someone you know, to come along as a way to find out more. "I am so pleased with the results I'm getting from your work. I feel so much better than when I started and I didn't think that was possible." "I was sceptical at first. I am walking further and faster as a result. Money well spent." "I am doing what I can at 60 to keep me going. I think this has been very helpful. I wouldn't say that unless I meant it." I've been plagued with a variety of health issues over the last 10 years. I started my journey with John Jo back January 2018. Having been to other chiropractors over the years I've been very impressed and grateful for the "adjustments" that have led to my improvement in both health & general wellbeing. About 2 years ago I suffered a disc herniation which was followed by a microdiscectomy op. Although the op dealt with the severe symptoms I was left with nerve pain that caused a lot of discomfort on a daily basis. Since my session with John Jo 3 months ago, the nerve pain is 99% gone and I am much more mobile. I can't recommend him highly enough. 5 stars!